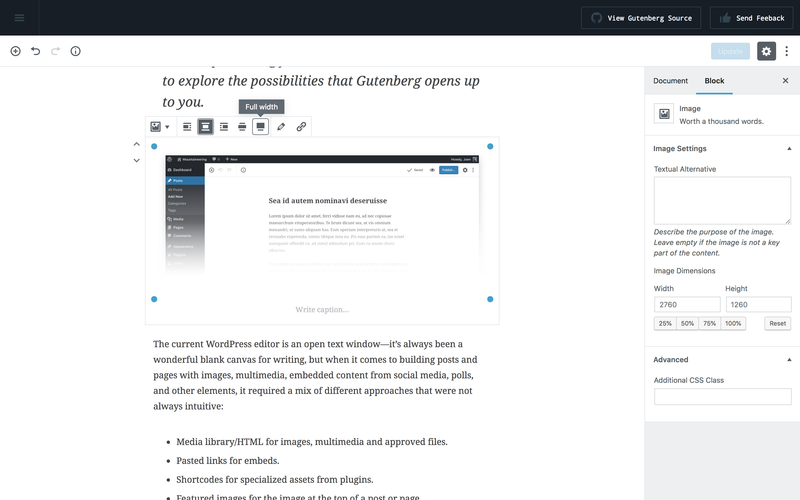 The Block Editor, formerly known as Gutenberg, is the name of the new post editing experience released in WordPress 5.0. WordPress 5.0 was released on December 6, 2018. When 5.0 is installed, it replaces the old post editor, which includes a visual mode with real-time previews and a text editor that displays the HTML code of the post content, with the block editor. 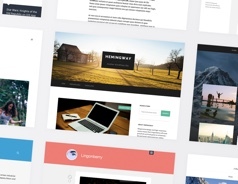 The block editor is the first revamp of the WordPress post editing experience since the inception of the content management system, and it introduces significant changes to how posts and pages are edited in WordPress. The block editor is built around the concept of blocks. Each element in the content of a page or post is a block – paragraphs of text, images, videos, blockquotes, lists, galleries, tables, and so on. Blocks can be added, deleted or moved around in the content, and each block has settings unique to the block type. In the image block, you can select which image to display, how to align it, and edit the caption. In the table block, you can add and delete table rows and columns. Eventually, blocks will be brought to other parts of the WordPress interface as well, replacing other elements like widgets and menus. If you want to reuse a certain block, you can save it as a shared block, after which you can add it with the click of a button on other posts and pages. You can give the editing experience a try on WordPress.org. Editing a image block in the block editor. The default blocks included with the block editor have the same capabilities as the formatting options currently included in WordPress, along with a bunch of new features that give users more control over the end result. The contextual settings for each block means that the block editor can provide additional settings without making the interface feel cluttered. The big difference between the block editor and the old editing experience in WordPress, in addition to the overall improvements in user experience, is that the block editor is built to be flexible and extendible so themes and plugins can add their own blocks with custom functionality and layout. For a company page, for instance, a theme could include a “Employee” block that can be added for each employee that should be listed on the page. Long term, the change to the block paradigm holds the promise of more dynamic page layouts across the board for WordPress websites. WordPress users who want to retain the existing editing experience can install the Classic Editor plugin, which restores to old post editing experience. The plugin will be supported until at least December 31, 2020, but since blocks will play a big role in the future of WordPress, installing the Classic Editor plugin is not a long-term solution.